Louisville, KY (December 7, 2012) – Shelby County dairyman John E. Kalmey has been named winner of Kentucky Farm Bureau’s award for distinguished service to agriculture. He was honored during the organization’s 93rd annual convention at the Galt House Hotel in Louisville, receiving an engraved watch and plaque. 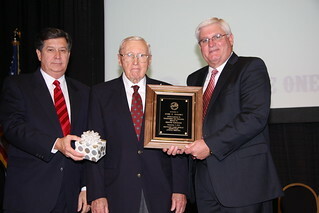 John E. Kalmey (center) received the 2012 Distinguished Service to Agriculture award at the organization’s 93rd annual meeting, held in Louisville. The award was presented by David S. Beck, KFB Executive Vice President (left), and Mark Haney, KFB President (right). Kalmey, 88, was raised on a Jefferson County dairy farm. He moved the operation to Shelby County in 1949, shortly after the death of his father. After starting his own operation with 25 cows and 189 acres, Kalmey slowly but steadily improved the operation while also becoming involved with various industry groups. He became one of the state’s most accomplished and well-known dairymen. His son, John C. Kalmey, currently runs the operation, which consists of 485 acres and a milking herd of 120 head. Kalmey’s service to agriculture is extensive. He has been a director of Shelby County Farm Bureau, member and chairman of the state Agricultural Stabilization and Conservation Service (ASCS) Committee, chairman of the Shelby County Ag Development Council, member and president of the Kentucky Holstein Cattle Club, board member and president of the Dairy Herd Improvement Association and a local leader with Dairymen Inc., which for many years was the state’s largest milk marketing cooperative. Kalmey is known for embracing new technologies and techniques. In 1945 he installed one of the first hay driers in a barn loft. In 1948 he became one of the first farmers to purchase a hay mower conditioner. He has employed a variety of conservation tillage practices. He has boosted breeding stock through several methods, including artificial insemination and the use of Dairy Herd Improvement Records. His late wife, Nina Mayfield Kalmey, kept the farm’s financial and herd records. Kalmey is a staunch advocate for preserving farmland. For many years he has been a host for the Leadership Shelby County farm tours that are aimed at promoting agriculture education and support from community leaders. His farm also has played host to a variety of other promotional events for agriculture. One of Kalmey’s close friends is Ray Moss Tucker of Finchville, who served as President of Dairymen Inc.
As a leader of the Dairy Herd Improvement Association, Kalmey helped implement programs to bolster the quality of dairy production in the state. He strongly supported an automated testing system for butter fat and sematic cell counts. Friends say Kalmey is especially proud that his three children are college graduates: John C. has a degree in animal sciences, and twin daughters, Joyce and Janet, have master’s degrees in education. Today, John runs the farm and the sisters are retired school teachers.